Get 50% Off Belva 12 Gauge Speaker Wire when you purchase a Belva Subwoofer Enclosure. Simply Click the "Add Both to Cart" button to the right. This offer cannot be combined with any other coupons or offers. You've got an awesome subwoofer there, pal. But where's it gonna go? You can't just throw that thing in the trunk and call it a day. Don't worry, Belva's got your back. With superior construction, great features and everything you need for bass, you'll be ready to pass up that entry-level box you've been eyeballing. 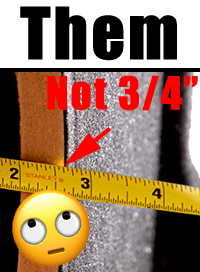 You get quality boxes with solid 3/4" MDF because nothing else will do the job right. You want to flex your windshield, not your box's innards. You get polyfill built into the box, making sure your subs perform perfectly. On top of that, you get a box that's CARB Phase 2 Compliant, meaning your box won't emit as much nasty formaldehyde as the competition. Better for your bass and better for you. Look, nobody buys a subwoofer and says, 'Aw man, I just want a teeny bit of thump.' Naw man, you want something that kicks you in the chest, but you need a box that's gonna put up with it. That's where Belva comes in. 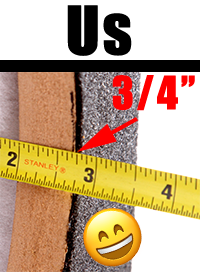 While other brands use less-than-optimal 1/2-inch MDF, we've got 3/4-inch MDF to make sure you get all the bass you can handle. Why risk a busted box? Belva's the obvious choice when it comes to giving your sub a good home and giving you the low end you're looking for. Internal box volume: 2.46 cubic ft. total air space - 1.23 cubic ft. per chamber. 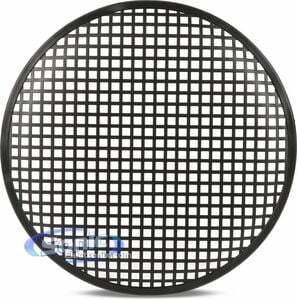 This is the shape of the enclosures cutout hole and defines the style of subwoofer that can be installed. The actual diameter of the hole in the subwoofer box. 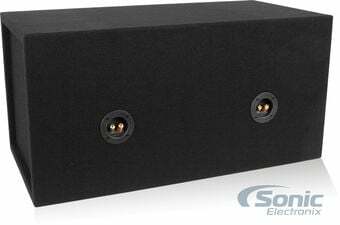 Length is the measured length per side of a square subwoofer or speaker opening. Your subwoofer or speaker must not exceed this dimension in order to properly mount in this enclosure. The internal volume measurement in cubic feet before subwoofer magnet displacement. This is the total air space inside each chamber of the empty subwoofer enclosure. By matching this value with the recommended air space of the subwoofer, you will be able to know if the subwoofer will match this box. I would recommend this product for the guy's out there that are serious about their music. If you got good, high quality subs, then this box will make them perform to your sub's max output with out worry of blowing up your box. have kicker 12, they sound alright have some loose paneling in my car, so I'm having trouble getting the clarity I want. over all its a box and it works. Cant beat the price. But it is really very good box. I put two 12" hifonic,also bought from here, with a 2 channel 1000 watt amp.It really shook my rearview mirror in my '97 towncar. My brother loved it so we put it in his '92 prelude.Wow!!! You can hear him before you see him. Great buy!!! I am on a budget, like most of us. I needed a nice looking box for a reasonable price. For $52.00 you can't beat it. I loaded my 2 12" Alpine TypeS subwoofers in it. Mounted my amp to the back and they are still going strong. I got my complete set up: 12" kicker subs box 1000watt Mbquart amp and amp kit. I have always installed my own equipment, I found it helpful that they have videos that covered some of the product they carry. 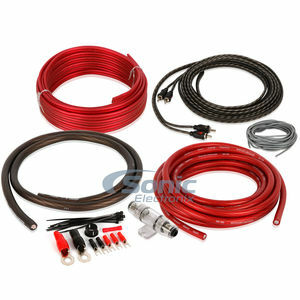 There are a few shop's in Texas like Best buy and Custom Sounds that offer equipment. But the professionalism of the knowledgeable staff the price and the reliability made it clear that I wanted to do business with them. Amazing Enclosure, Even Better Price. Ordered this as my first enclosure, put two 12" subs in it and I haven't found a box that hits as hard and as clean as this one has. 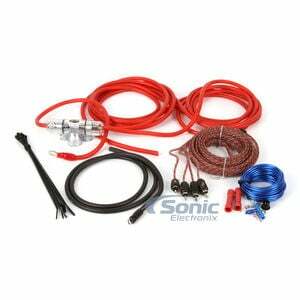 Will definitely buy from SonicElectronix again for my car audio needs. Appears to be fairly well built. Arrived with a little dent and a tear but its too little to bother with. Sounds nice but doesn't hit as deep as I would have liked. Small size however, leaves me some room for a couple of bags of groceries. Three stars for durability since I've only owned this for about a month. Bought the MDFD12 for my son. Installing the subwoofers was very easy and the enclosure looks great. Highly recommend. product worked for my new hifonics subs. 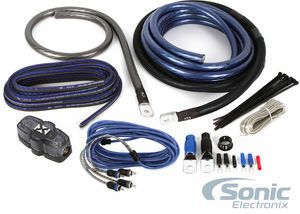 that will be a winter system for my ride so i don't have to keep my main subs in all year round. i really like it mostly because its has black carpeting. Solid sealed enclosure. Two of them barely fit in the back of my 02 Focus SVT 3 door. The binding posts are cheap, I tightened them as I would other posts but one out of eight wouldn't tighten because the thread tolerance is poor and it acts like its stripped, I can get some pressure on the wire but I worry it will come loose. Probably worth spending a little more money on a better enclosure but it works fine if you're on a budget. I ordered this for 2 crunch gpv's about six months ago because I didn't have the tools to properly build my own box. After six months this box is still holding up and works perfect with my subs. This enclosure is a well built enclosure for sq applications. I purchaced to house 2 CV vmax 122 drivers and the sound quality was almost rubbery? not tinny, never a crackle....fluid almost..... call it a well dampened sound with minimal distortion. just clean bass all the way into the 20s. made sounds i diddnt know existed. if you dont care how your music sounds and just looking for loud, look elsewhere. my only complaint, 11" cutout is too small for the vmax and the black carpet is difficult to follow a line with the router. The box is very good at 1.25 cubic feet. I'm running 2 12's with 800 watts rms and it hasn't shattered. Wish it was 1.35 cubic to accommodate for subwoofer basket displacement but it still makes makes subs hit ridiculously hard. Polyfill helps make the box seem bigger due to mechanics and the "Q" point. I really couldn't be happier! Built very sturdy except for the terminals. Its easy to switch those out though so no complaints. Thanks Sonic! I purchaced your Dual 12" sealed sub enclosure and added two Alpine R's and fosgate 1000w amp and WOW does not even come close, it Rocks. The quality of the box is really really impresive. The carpet in not the junk material I've seen in my other buddies combo's. 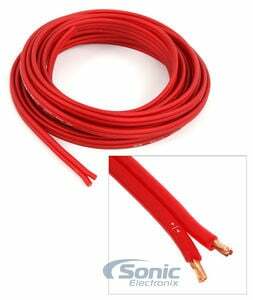 When you buy this box you know it will deliver and last a long time.... Sonic, keep up the good work! I ordered this item for my grandson and he loves it. The whole was no the size it said it was. I happen to be a part-time handy man so I had a circular sander and was able to make the whoel bigger. Took about an extra 20 mins of work to mount the subs, but overall everythign worked out. No complaints about box. It is doing it's thing! The box is leaking now. But the price and design was worth it all in all; it's just due to be resealed. It is a good prefab sealed box. I looks good and is functional. Its cheap, in price. Yeah, we see that. But let your worries go to rest, this is a GREAT BOX. Its well made, and put together great. Although they did use nails instead of screws, if you know what your doing, it won't slow you down. I have 2 12" Kickers in this baby, and pounds like a mofo. Get this box. You won't be disappointed. Best box for the price. I bought this box to house two Pioneer TS-W309D2 subs. Box has a solid construction. I could not feel any air coming from the seams. The sub box was really good. i have 2- 12 inch Memphis audio 15-M3124D's in this box each putting out 2000 watts max hooked up to a MA audio HK10KA amp rated at 10,000 watts max. i have the subs bridged and it has way too much power going to them but the box still stands up. i would recommend that when you install your subs that you put some sort of foam stripping underneath the lip so when you screw it down you wont have and leaks at all. Ok so I bought this box because I wanted a quick sealed enclosure for my 2 JL W3's. The box is made pretty solid, true 3/4 MDF but the caulk job on the inside was kind of off but that's nitpicking. Haha after 3 weeks though of pushing my W3s the top of the box is leaking air. So not the best made but definitely a good pre fab and pretty cheap. Can't really complain. It is nailed together tho so yea.. 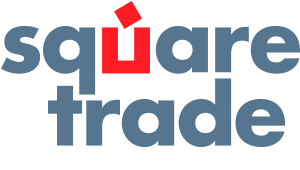 If you are looking for a quality made box this is it !! I was very impressed with this box the moment I opened it. The WOW factor was at least a 10.5 on the 1 to 10 scale. I WILL BUY AGAIN . i bought this box about a year ago for 2 of my infinity reference 1260w subwoofers. I have two more in a ported box. im pushing 350w to all 4 and I have to say I like this box more than the ported. you feel it more in the sealed box but lose a little on the db's but its worth it. the box is sturdy and hasn't showed wear a bit. its tuned in the lower 40's so you wont get stupid low with it but can get loud. I would recommend it to anyone on a budget or to lazy to build their own box. it comes with polyfill which is a bonus, the terminals on the back need calked but that's with about any box you buy. overall I like it and would buy again if I had to. This is a great box. I prefer ported but my trunk is too small for it so I had to go with sealed. I'm still happy though. This had the perfect size for my 12s. Also the measurements are a little off. The box is a little bigger that the description said. Great box for the price and it can fit in any trunk. Installed this weekend, I did add a couple pounds of "pillow stuffing" since the box was a tad smaller then what I needed. I have noticed some flex already but im not suprised with the subs that are in it. I will add triangle shaped gussets and some "trim screw" to try and hold things together. A sheet of real MDF (not the cheap underlayment) is $32, carpet and glue around $15 so for what they want for this its a good deal that just needs some minor tweaks. Perfect size to fit my Infinity subs. Wish it came with mounting feet but can't ask for everything. Quality is legit for the price. Just your average rectangular box. Fit in the trunk of my 240sx which is pretty small. GET WHAT YOU PAY FOR!! This box looked great and felt very durable. My subwoofers wouldnt fit at first so I had to do some shaving, NO PROB. It sounded good for awhile and I loved it. After about two weeks, it lost its sound, went to check out the problem the whole front of the box had almost came off, Box was sealed very well, too bad they used nails instead of screws, would have been a very good box. this box is light weight. its made strong and fits every sub ive ever used in it. This box is pretty clean...nice black fabric, enough to hold the subs and gives them enough air to makes the subs bump and bump and bump and bump! Good buy at an unbeatable price. Awesome. Superb Box! Tight sounding bass, and best of all deep rumbling bass. Excellent for an audiophile like me. Runs 2 Rockford Punchs in and no air leaks and bass is clear as hell. Any 12 would sound great in this box, would buy again if it ever goes bad. Subs fit great and the construction was sound. Thanks Sonic! Everything was going perfect with the two sub woofers i purchased. Great price & everything. But then someone stole my car & the woofers were in it. Anyways, they were GREAT while I had them. This is a great sub woofer box for the price it is heavy 41 pounds and it is sturdy. I have 2 12 kickers 600 rms 1500 peak and they sound great in this box hits lows and highs hard. I would say to any one buy it. Carpet job is top notch, Good quality carpet stretched perfectly over the box. All joints are glued and caulked well. theres no need for extra bracing here but you may add some 2x4's to reduce the airspace if needed. The gold push terminals are well sealed in place. Don't be afraid of the price. It's a perfect price for a box of this caliber. Would recommend it to anyone. It's tough to build a box for the price you can buy one of these. They are solid. I haven't had any issues with mine. I would definitely recommend this box to a friend, Nothing like a good old professionally made box, I love the material that they put in it, it really adds to the sound. Not much else to say besides great product. Shipped in only 3 days, and the pre-done polyfill is a great touch. My only comlaint would be that my car smelled like glue for a few days after I put this box in, but that's just nit-picking. Will definitely order boxes from Sonic in the future! Don't let the skimpy price fool you. This box is made very well and it's ready to go. The joints are already caulked and glued - so there is nothing more to do than mount you speaker. It's not MDF(medium density fiberboard) like all the others, it is made from HDF; high density fiberboard. HDF boxes are typically stronger, stiffer, and lighter than MDF enclosures. The box does not require any additional bracing because of its density. 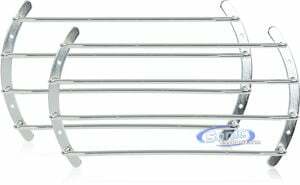 It has a high an undetectable high frequency resonance and doesn't color the sound of your bass with unwanted buzzing or flexing. The HDF box is lighter than MDF because it has smaller fibers that when pressed and heated require less glue and resin to bind the fibers together. 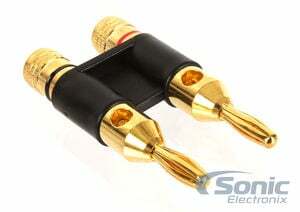 The speaker terminals are screw type gold plated binding posts that will hold 12 g speaker wire easily. They screw into the enclosure for added strength and a tighter seal. Just make sure that you do your math and pick the right sub for the cubic feet and stuff with poly fiber fill. This is an awesome enclosure. The price is very competitive as well. I am running 2 Rockford Fosgate R2D2-12 and there is no distortion at all. It is a very tight, clear sound. I highly recommended for anyone looking for a high quality low cost setup. I bought this box for some Rockford Fosgate P1's and I couldn't be happier. The box is solid and produces some really good sound in my Audi. I like it, I think the covering looked good but I ended up messing it up trying to screw something into the outside. Otherwise i liked the box, my subs hit good in it. This box is designed well. It is assembled, sealed, and carpeted very well. Speaker terminals are nice inside and out. Couldnt be any happier with this enclosure. Will use box with various subs. I have this box with two hifonics subs, hooked up too a hifonics 1600 wat amp. Its a very good box and hits really good. Would approve to anyone. Great box. Quality carpet job, all seams sealed correctly and well, and the terminals are strong and functional. Perfect basic box to make two twelve's hit perfectly. Just remember this is a sealed box, so it will have a differnet sound than that of a ported or bandpass box, but if u want a tighter hitting bass, this box if perfect. Nice heavy, good sounding box. 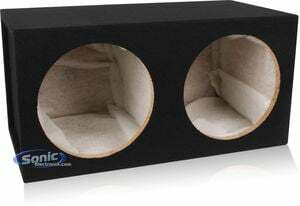 I would reccomend putting some polyfil to "cushion" the backfire of the subwoofer, really helps w/any sealed box and totally makes a valuable difference considering it only costs about 5-10$ more. The box itself is well sealed and well made, the connectors on the inside and out are really easy to use and once connected your wires will stay put. This is a well built box. Great quality carpet. If you want a good box without paying high prices this is perfect. Great box, holes were perfect sized and nice mounting depth! My triple voice coil Infinity Kappas with the 1600w amp SLAMS!!!! when i bought this box i wasnt really expecting much, because of the price an all but when i put my rockford fosgates's in it, it did sound great, and let me tell you im gettin 2 12 alpine type r next and im for sure going to be getting this box again. Cheap and effective! This is truly one of the best boxes that i have bought for the price it is. Sounds great and made very well! had to trim the 12" hole for my Sound stream PCO.12 subs they wouldn't fit at all. once I trimmed the MDF I love this box. they could have used spring term instead of screw though. I bought this for my husband for his birthday and he loves it! This box is great for the low! I don't have nothing bad to say about this product.... The sound quality is awesome with this sealed box. Purchased this enclosure for my son's first system in his '16 Cruze. Great alternative to building a custom enclosure. Great match for the ID12s I had leftover from a previous system. 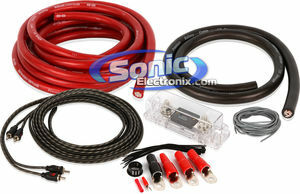 Also, as always, Sonic Electronix has the best prices and ships fast. I was very surprised with the quality of this box. It was well made for it being a prefab box. The polyfil definitely gives the bass a deeper sound. Nicely built and good for breaking in any subwoofers. Highly recommended if you like that nice clear sound that cam hit that tight bass. I bought this to put some ID Max's in for my daily. Build quality is good and the price was right. The box was good enough for me to buy another for some first gen JL Audio 12W3's that I was selling. Perfect fit for my car.Love the carpet cover.Would recommend you carry gray carpet covered boxes. Solid product. I wouldn't put a subwoofer heavier than 30-35 lbs each in it thought. It's lined with polyfil so you'll have to cut a small hole where the terminals are but other than that it's a pretty good box for the price. I would reluctantly recommend this box. The one I received was already slightly damaged in the corner with carpet coming away from some of the seams in the corners even though it was brand new from eBay. Ordered my box and had it at my front door in 2 days! Great box. Its very well built and pure mdf and thick mdf wood. Nice carpeting. Only down fall i see is there was no poly fill and terminals are on sides instead of rear. I thought it was suppose to be this one pictured and both are the same numbers but different box but i am still very very pleased! This is a very well constructed box, well sealed and solid. However, mine arrived new in the box and every corner had the carpet worn off and bare wood showing. Also, mine was not lined with poly-fil and the terminal cups were on the sides rather than in the back as it appears in photos- no biggy but that did influence my decision as my install would have been a little "cleaner". All in all it sounds great and seems extremely durable. I always try new subs in a sealed and then ported box. This Belva is a great value and a solid , sharp looking sub box. The item did not live up to my expectation because it arrived empty and damaged. But for the price its a pretty durable box. I ordered this box for a pair of AudioFrog gb12d4-12, the box came with a couple of nicks from shipping. And didn't have the poly fill. Customer service was on point. This was already the best deal for a 3/4" MDF dual enclosure I could find, everything else in this range is 5/8". For the price I wasn't expecting much. However When it arrived found it is of good build quality, with decent carpet. They already lined the inside with polyfil, more added value. Then to top it off, found it has really nice gold plated screw type wire terminals. Better connection and added peace of mind that connections will not come undone. This is probably the best deal/value on the internet for a dual 12 enclosure. Probably why it's backordered at time of this review. I put 2 mtx sub and the bass is really deep,the best, the price is really good. 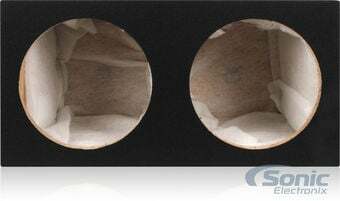 A very well-built and nicely carpeted sub box, that looks great, and should prove to be very durable, as it is constructed with 3/4" MDF instead of thinner material of many other boxes costing more than this. 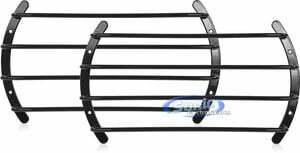 The black carpet makes more of an impact than the typical gray carpet, and the 5-way binding posts are much higher quality than the typical plastic spring connections normally found on sub boxes. Comes with literally everything you'd need, fits perfectly in my 2014 dodge charger rt. Only think I had to buy in addition was a gauge to be able to lower the volume on the bass. Other then that I love it! 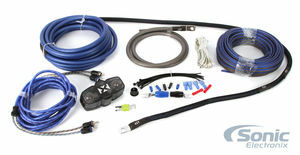 Single amplifier 4000 Series complete installation kit. 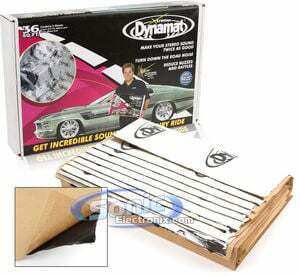 Make your sound system sound perfect by reducing road noise with 9 sheets of sound dampening material. These high grade banana clips allow you to plug into your banana clip ready terminal for a secure connection. 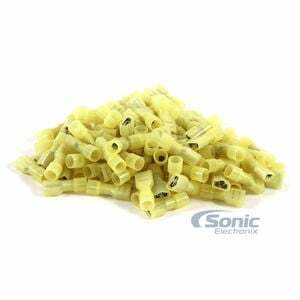 100 pack of 12-10 Gauge yellow insulated quick disconnects. 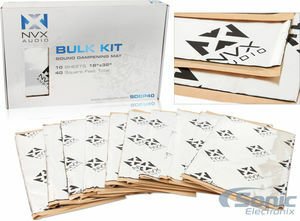 Spray adhesive used for adhering carpet to subwoofer boxes without bubbles or can be used for your polyfil. 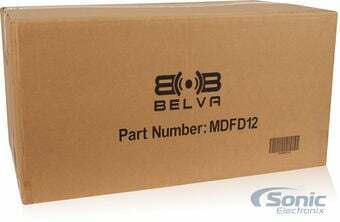 View all available accessories for the Dual 12" 3/4 MDF Sealed Subwoofer Enclosure (Belva MDFD12).